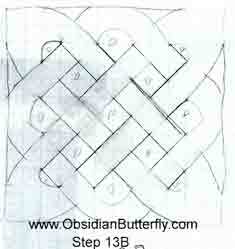 Celtic Knotwork is mysterious and beautiful, and creating your own is a rewarding meditation. 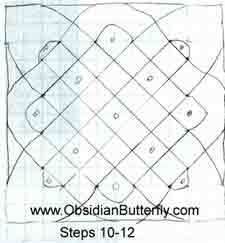 There are many methods in books and on the Internet that show how to draw Celtic Knotwork. While trying out several in preparation for a class in Celtic Magic and Mythology, I realized I had made up my own, which seemed much easier to follow. This method constructs closed knots (no edges hanging out) with square corners. 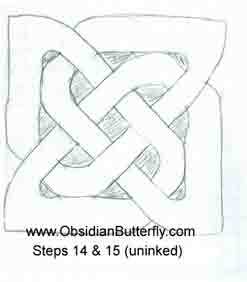 To learn to draw open knots (edges hanging out) visit the other drawing page. If you are interested in purchasing a Celtic Knotwork Mandala, custom made and infused with energy just for you, please visit my Offerings page view the samples in my Artwork section. In the upper left corner of the paper, lightly draw a 4 block square. Immediately below and to the right, place two dots. 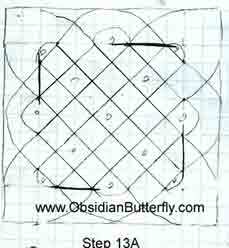 Continue drawing dots every two boxes and hooping every other set with dots until the length of the gird is the size you desire. After a non-looped dot, draw another light square and a dot just below it. 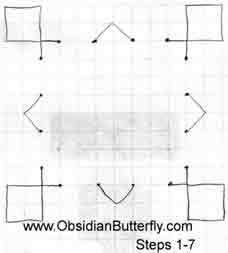 Continue down the side following the same formula in 4 and 5, working your way around the rectangular/square shape. 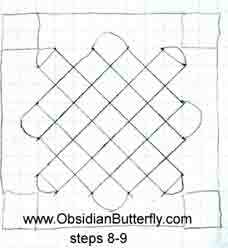 Lightly connect all squares to form an outline. Connect all dots with 45-degree lines using your straight edge. Extend the four corners & erase the inner edges of the corner boxes. Make large arches connecting over the smaller arches from steps 4 & 5. These arches should just touch the frame drawn in step 8 but not extend beyond it. VERY LIGHTLY shade or place a dot within each small arch. These will be open spaces in your knot. Follow each ribbon across, shading every other section. A) You may choose your breaks now. B) Start your under/over lacing. If you are new to knotwork, choose option B. Whichever option is left from 13. Fix up your knot. When you are happy with it, go over the lines in ink and crosshatch the dark spaces. WHEN THE INK IS DRY, erase all the pencil. The beauty of Celtic knotwork is not just the over/under weaving (although drawing just the weaving can be hypnotic). It is the breaks, where the weaving curves in unexpected ways. I am fond of symmetrical breaks and 4-part (mandala) knots, but they don't have to be that way. Each basic knot has many ways it can be configured. The sample knot for this exercise was a 9-part knot (four corners, four edges, one middle). Here are over SIXTY ways this small knot can be configured. Includes an unbroken (basic) version for comparison. These knots were made with the celtic knot font from http://www.clanbadge.com/knots.htm which is how I draw all my computer knotwork. Some practice knots I made by hand (pencil) using this new technique (un-inked). I also offer custom channeled knotwork (drawn by a different method).